Is it just me, or are you getting sick of Shrek as well? The guy is everywhere. This marketing blitz is unlike anything I have seen. Here is a partial list of the products currently adorned with the ogre’s chartreuse countenance: Sierra Mist. Frosted Flakes. Froot Loops. Pop-Tarts. Snickers. M&M’s. Cheez-Its. Keebler cookies. Even my beloved McDonald’s has been infiltrated, although the company claims they intend to use Shrek to promote their healthier items. At the same time, Shrek appears in a public service spot for Health and Human Services, encouraging kids to exercise regularly. That’s just what kids need to hear from an overweight, bile-colored monster who peddles junk food like a ballpark vendor. I suppose the folks at Dreamworks are cashing in while they can. 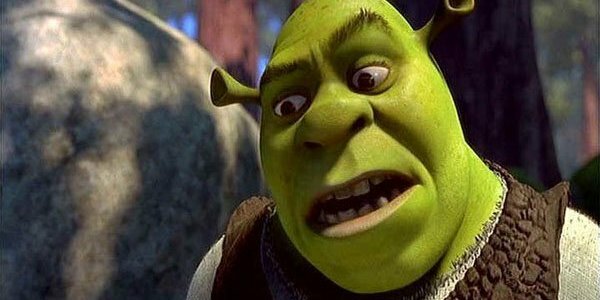 While the first film was terrific and the sequel still highly entertaining, reviews of Shrek the Third indicate that Shrek may have jumped the shark. So they’re going to use him in every way possible while the character still has merchandising potential. I wouldn’t be surprised to see Shrek hawking male enhancement products anytime soon. Mike’s First Rule of Technology: Just because something can be accomplished with technology does not mean it should be. Examples: Happy Feet, spray-on hair, billionaire space tourists, Britney Spears’ singing voice. So I’ll catch Shrek the Third this weekend, and no doubt I’ll be wowed once again by the visuals, if not the script. And after that, if I never see Shrek again, that’ll be just fine with me.